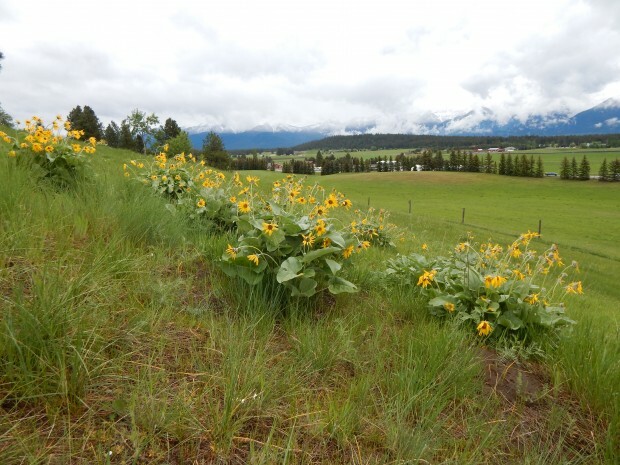 May 10, 2016 – Flathead Land Trust, in partnership with the Darrow family, permanently protected the Darrow family’s Paladin Farm near Bigfork with a conservation easement on May 10th. The 200-acre property, at the junction of Highways 35 and 82, includes farmland, forested ridges visible from the highways and an old farmhouse and barn. 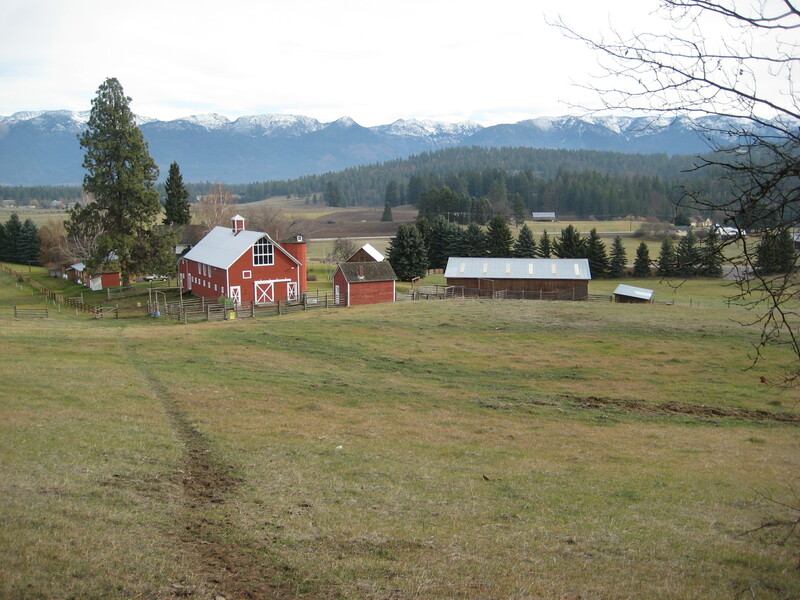 In 1968, George Darrow bought the old homestead property just north of Bigfork to farm and enjoy. The Paladin Farm became well known and is visible to those traveling to and from Bigfork. The property includes an old homestead cabin built in 1894, and a lovely barn and farmhouse built in the early 1900s that George and his wife Elna worked to restore. The Darrows also purchased land north of the property and ran an extensive farming operation on both properties, growing grain and hay and raising livestock. In 2009, Elna passed away with George passing away early in 2015 at the age of 90. “As an ongoing tribute to George Darrow, his children, Roy, Karen and Reed Darrow are honored to finalize a conservation easement on the family farm near Bigfork, in conjunction with Flathead Land Trust. We feel a conservation easement honors our father’s endeavors to protect and conserve open space, offer wildlife habitat and encourage agricultural enterprise in the Flathead Valley,” read a statement from the Darrow family. The stunning property not only protects open space and scenic values near a growing community, but is strategic in providing habitat and migration corridors for many animals. Its proximity to the confluence of the Flathead River with Flathead Lake renders it paramount for protection. Large areas along the north shore of Flathead Lake are protected as Waterfowl Production Areas and outlying open lands provide habitat for many species. Additionally, the proximity of the property to the Swan River, many smaller lakes and ponds, and the Swan Mountain Range to the east also supports some of the richest habitat in Montana, and is important for many animals in the area. The land also provides natural habitat for species listed as threatened by the U.S. Fish and Wildlife Service such as grizzly bear as well as those listed as Species of Concern by the State of Montana such as fisher, little brown myotis, pileated woodpecker, brown creeper, Cassin’s finch, and evening grosbeak. “It’s been a real honor to work with the family to extend George’s tremendous conservation legacy,” said Ryan Hunter, Flathead Land Trust’s Land Protection Specialist who worked to complete the project with the Darrow family. The legacy of George Darrow is profound and far reaching here in Montana, especially considering the incredible civic support and leadership he devoted to Bigfork and northwest Montana through many years of volunteerism. Called a “pillar of Bigfork”, George began developing his conservation and community impact by ensuring the protection of our inalienable rights through the Montana Constitution to a clean and healthful environment. George served as a Republican lawmaker in both the House of Representatives and the Senate of the Montana legislature from 1967 to 1974. One of the chief legislations George authored was the Montana Environmental Policy Act in 1971, which helps to protect and preserve Montana’s environmental and water quality. He was also a sponsor of the Montana Water Policy Act in 1967, and remained a vocal advocate for clean water. Throughout his life, he actively participated in environmental organizations and stayed politically active, successfully influencing environmental legislation. On a local level, he spearheaded an effort to conserve Cougar Canyon, a tract of state land on the mountainside above Woods Bay, as accessible public property. George contributed to the Bigfork community as a founding member of the Bigfork Center for Performing Arts, Sliter Park, and as a member of the Bigfork Chamber of Commerce. Flathead Land Trust believes the conservation easement on the Darrow property will continue a legacy that George was dedicated to protecting for all Montanans. “Many years into the future, the open space and wildlife habitat that may have otherwise been lost to development, will continue to greet highway travelers with its scenic beauty, and provide opportunities to continue traditional agricultural practices on the land. For that, we can all be thankful,” said Paul Travis, Flathead Land Trust’s Executive Director. To help complete this conservation project, the Flathead Land Trust was awarded a Travelers for Open Land grant. Travelers for Open Land was launched in 2009 and since then has awarded close to $220,000 to help fund 35 private land conservation projects throughout Montana. Give a Year End Gift for Conservation – and Double Your Giving Impact!